Metro Rod serves national business customers across multiple sectors including facilities management, retail, water utilities, social housing, hospitality and insurance, as well as local businesses and other customers in the private and public sectors. Domestic customers form only a small part of Metro Rod’s business. Metro Rod’s specialist drain clearance and maintenance services include high pressure water jetting, CCTV surveys, drain or sewer lining, excavation, electro mechanical cleaning and fat and grease management. Metro Rod is part of Franchise Brands. Other members of the group are Barking Mad, Chipsaway and Ovenclean. Metro Rod is looking for franchisees in Scotland to join our growing network. Opportunities exist to build your business into a multi-van operation. The Metro Rod franchise model is a proven success that has remained resilient against recession: our emergency unblocking and repair services as well as regular drain maintenance programmes have kept our drainage franchisees busy through good economic times and bad. 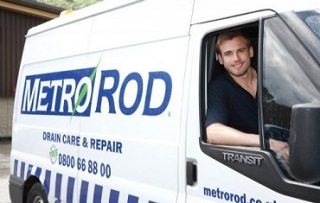 You can be sure that when you invest in a Metro Rod franchise, you will receive the highest levels of support across all areas of your business, with back up from a 24 hour UK call centre, extensive Head Office support and access to established national contracts with high street names and blue chip companies. It is in our best interests to help you to make a success of your business. You don’t need drainage experience as we will provide industry-leading training to help you reach the ISO level service that our customers demand. The minimum investment for a Metro Rod franchise is £25,000. “You have guaranteed work as well as the support from Head Office. I started with the Brighton territory in 2013 but it is going so well I have also invested in two other territories along the South Coast. We are now building our own new offices to support the larger business, with 14 engineers and related support staff!" Metro Rod have new opportunities available across Scotland as well as a several existing franchises for sale.